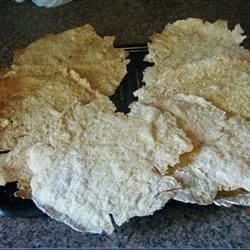 "This is a wonderful whole wheat cracker-like bread. It is great topped with butter or cheese. Better yet, it is simple, too!" In a large bowl combine the whole wheat flour, all-purpose flour, oil, baking soda, and salt. Add enough buttermilk to make a stiff dough. Knead dough for 30 seconds on a well-floured surface. Cover dough to prevent drying. Roll 1/4 cup handfuls of dough into balls and pat into a flat circle. Using a rolling pin, flatten dough into 10 inch circles. Place onto ungreased cookie sheet. Score pieces into pie shapes by running a knife along but not through dough. Repeat process with remaining dough. Bake in a preheated 350 degree F (175 degrees C) oven for 8 to 10 minutes. Cool on wire rack briefly before breaking along scored lines. A good little, simple recipe. On my second batch, I left it in the oven for an extra tenminutes, and they became like little crackers that can keep for a long time!